The name "Saints" is an allusion to November 1 being All Saints Day in the Catholic faith. New Orleans has a large Catholic population, and the spiritual "When the Saints Go Marching In" is strongly associated with New Orleans and is often sung by fans at games. The franchise was founded on November 1, 1966. The team's primary colors are old gold and black; their logo is a simplified fleur-de-lis. They played their home games in Tulane Stadium through the 1974 NFL season. The following year, they moved to the new Louisiana Superdome (now the Mercedes-Benz Superdome, since Mercedes-Benz has purchased the stadium's naming rights). For most of their first 20 years, the Saints were barely competitive, only getting to .500 twice. In 1987, they finished 12–3—their first-ever winning season—and qualified for the NFL playoffs for the first time in franchise history, but lost to the Minnesota Vikings 44–10. The next season in 1988 ended with a 10–6 record, but no playoff berth. Following the 2000 regular season, the Saints defeated the defending Super Bowl champion St. Louis Rams 31–28 to notch their first-ever playoff win. First the brainchild of local sports entrepreneur Dave Dixon, who later built the Louisiana Superdome and founded the USFL, the Saints were actually secretly born in a backroom deal brought about by U.S. Congressman Hale Boggs, U.S. Senator Russell Long, and NFL Commissioner Pete Rozelle. The NFL needed congressional approval of the proposed AFL–NFL merger. Dixon and a local civic group had been seeking an NFL franchise for over five years and had hosted record crowds for NFL exhibition games. To seal the merger, Rozelle arrived in New Orleans within a week, and announced on November 1, 1966, that the NFL officially had awarded the city of New Orleans an NFL franchise. The team was named for the great jazz song most identified with New Orleans – "When the Saints Go Marching In", and it was no coincidence that the franchise's official birth was announced on November 1, which is the Catholic All Saints' Day. When the deal was reached a week earlier, Dixon strongly suggested to Rozelle that the announcement be delayed until then. Dixon told an interviewer that he even cleared the name with New Orleans' Archbishop Philip M. Hannan: "He thought it would be a good idea. He had an idea the team was going to need all the help it could get." Boggs' Congressional committee in turn quickly approved the NFL merger. John W. Mecom Jr., a young oilman from Houston, became the team's first majority stockholder. The team's colors, black and gold, symbolized both Mecom's and New Orleans' strong ties to the oil industry. Trumpeter Al Hirt was part owner of the team, and his rendition of "When the Saints Go Marching In" was made the official fight song. Archie Manning, pictured attempting a pass in 1980, was one of the first players to be inducted into the Saints' Ring of Honor. The inaugural game in 1967 on September 17 started with a 94-yard opening kickoff return for a touchdown by John Gilliam, but the Saints lost that game 27–13 to the Los Angeles Rams at Tulane Stadium, with over 80,000 in attendance. It was one of the few highlights of a 3–11 season, which set an NFL record for most wins by an expansion team. For most of their first 20 years, the Saints were the definition of NFL futility. They did not finish as high as second in their division until 1979. The 1979 and 1983 teams were the only ones to even finish at .500 until 1987. One of the franchise's early bright moments came on November 8, 1970, when Tom Dempsey kicked an NFL record-breaking 63-yard field goal at Tulane Stadium to defeat the Detroit Lions 19–17 in the final seconds of the game; the previous record was seven yards less, set in 1953. Dempsey's record was not broken until 2013 by Matt Prater of the Denver Broncos, who kicked one yard farther (at elevation in Colorado). Tom Benson, a successful automobile dealership owner and banker, acquired the franchise in 1985, and hired Jim Finks as general manager and Jim Mora as head coach. That combination provided the Saints with their first-ever winning record and playoff appearance, going 12–3 in 1987, which had one fewer game than normal due to a players' strike. Another playoff berth would follow in 1991, and the club's first division title came in 1991. During Mora's tenure, the Saints made the playoffs four times, with teams marked by strong defenses led by the "Dome Patrol" linebacking corps, but they were never able to win a playoff game. Mora coached the Saints until the middle of the 1996 season, when he stepped down halfway through the 3–13 season. His 93 wins were three more than the Saints won in their entire history prior to his arrival, and would remain the most for any Saints coach until 2016. In 2003, the Saints again missed the playoffs after finishing 8–8. The 2004 season started poorly for the Saints, as they went 2–4 through their first six games and 4–8 through their first twelve games. At that point Haslett's job appeared to be in jeopardy; however, he managed to win the three straight games leading up to the season finale, leaving the Saints in playoff contention in the final week of the season. In week 17, the Saints defeated division rivals Carolina; however, the Saints needed other results to break their way and when the St. Louis Rams beat the New York Jets the Saints were eliminated despite having beaten the Rams, who finished with the same record. The Rams, Saints, and Vikings all were 8–8, with the Rams having a 7–5 conference record, Saints 6–6, and the Vikings 5–7. The Rams received the #1 wild-card due to having the best conference record out of the three, followed by the Vikings due to the 38–31 loss handed to the Saints in Week 6. Haslett was fired after the 2005 season, in which the Saints finished 3–13 and did not play any regular season games in New Orleans due to Hurricane Katrina. Due to the damage Hurricane Katrina caused to the Superdome and the New Orleans area, the Saints' scheduled 2005 home opener against the New York Giants was moved to Giants Stadium. The remainder of their 2005 home games were split between the Alamodome in San Antonio, Texas, and LSU's Tiger Stadium in Baton Rouge. On March 14, 2006, the Saints signed former San Diego Chargers quarterback Drew Brees to a six-year, $60 million deal. 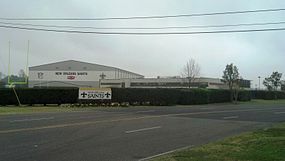 On March 23, the Saints announced that the team's two 2006 preseason games were to be played at Shreveport, Louisiana, and Jackson, Mississippi. After a $185 million renovation of the historic stadium, on April 6 the Saints released their 2006 schedule, with all home games scheduled to be played at the Superdome. On September 19, Saints owner Tom Benson announced that the team had sold out the Louisiana Superdome for the entire season with season tickets alone (68,354 seats), a first in franchise history. The September 25, home opener, the first home game in New Orleans after Hurricane Katrina, was won by the Saints 23–3 against the Atlanta Falcons, who were undefeated in the 2006 season at that time. The attendance for the game was a sellout crowd of 70,003. Meanwhile, the broadcast of the game was ESPN's highest-ever rated program to date, with an 11.8 rating, and viewership by 10,850,000 homes. It was the most-watched program for the night, broadcast or cable, and was the second-highest rated cable program of all time at the time. Green Day and U2 performed "Wake Me Up When September Ends" and "The Saints Are Coming", respectively, before the game. The game received a 2007 ESPY award for "Best Moment in Sports." The game is remembered by Saints fans for Steve Gleason's blocked punt on the opening series that resulted in a touchdown for New Orleans. On December 17, the Saints clinched their third division title and their first NFC South title in franchise history. For the first time in Saints' history, they clinched their NFC South title on their home field. 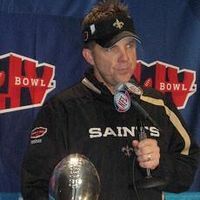 Sean Payton became the second consecutive Saints coach to win a division title in his first season. After the Philadelphia Eagles beat the Dallas Cowboys 23–7 on Christmas Day 2006, the Saints clinched a first-round playoff bye for the first time in franchise history. After the first-round bye, the Saints beat the Philadelphia Eagles 27–24 in the Superdome in the 2006 Divisional Playoffs. No team had ever had such a poor record in the prior year (3–13) and then gone on to a league or conference championship game since the 1999 St. Louis Rams who advanced to win their first Super Bowl after being 4–12 the season before. Since the Saints' only previous playoff win was in the wild card round, this was the farthest the Saints had ever advanced at the time. The victory was only the second playoff win in team history. The season ended on January 21, 2007, when the Saints lost 39–14 to the Chicago Bears in the NFC Championship game. Following a disappointing 7–9 record in the 2007 season, the Saints ended the 2008 season 8–8. Failing to qualify for the post season for the second straight year, the Saints found themselves struggling on defense. However, the Saints would match the explosive offense they had in the 2006 season. Drew Brees ended the 2008 season just 16 yards short of beating Dan Marino's single-season record of 5084 total passing yards, and receiver Lance Moore came 72 yards short of his first 1000-yard season. The 2009 season was the team's most successful season, which culminated in the franchise's first league championship win against the Indianapolis Colts in Super Bowl XLIV. After achieving a record of 13–0 with their win over the Atlanta Falcons, it marked the Saints' best start to a season in its franchise history. The result clinched an NFC playoff berth, a bye in the first round of the playoffs. By winning their first 13 games, the Saints also set the record for the longest undefeated season opening (13–0) by an NFC team since the AFL–NFL merger, surpassing the previous record (12–0) held by the 1985 Chicago Bears. However, they would fall victim to the Dallas Cowboys in week 14, going on to end the season with a three-game losing streak. The Saints became the first team to win a Super Bowl after losing its last three regular season games. The Saints 2010 season began in the Superdome as the defending Super Bowl champions defeated the Minnesota Vikings 14–9, in a rematch of the 2009 NFC Championship Game. It was played on Thursday September 9, 2010 and televised on NBC, making it the first time the Saints have opened the NFL's season at home. On Sunday, August 8, 2010, NBC announced the televised opening festivities of the evening would begin with Taylor Swift and Dave Matthews Band. On December 27, 2010, with a 17–14 win against the Atlanta Falcons in Atlanta the Saints clinched a playoff appearance (wild card). This marked the first time a team in the NFC South had made back-to-back playoff appearances since the division was formed in 2002. The Saints would face the Seattle Seahawks for the wild-card opener at Qwest Field. The Seahawks were the first NFL team to capture their division with a sub-.500 regular season record (7–9). Drew Brees completed a postseason-record 39 passes for 404 yards and two touchdowns. Despite throwing 60 passes and hindered by a lack of depth at running back, last year's Super Bowl MVP was not intercepted and rallied the Saints within 34–30 in the fourth quarter. In the end, his efforts were negated by a defense that could not get enough stops and a late touchdown run by Marshawn Lynch breaking over a half-dozen tackles with 3:22 left which helped the Seahawks defeat the Saints 41–36. The Saints began their season with a loss against the Green Bay Packers, but the team rebounded for the next four weeks to bring their record to 4–1. A loss to the Tampa Bay Buccaneers brought the record to 4–2, but the team bounced back with a 62–7 blowout win against the struggling Indianapolis Colts. A surprise loss to the St. Louis Rams resulted in the record dropping to 5–3. In the next seven weeks the Saints beat talented teams such as the eventual Super Bowl XLVI champion New York Giants, Detroit Lions, and Atlanta Falcons, bringing their season record to 12–3. To cap off the season, quarterback Drew Brees broke the single season passing record held for over 25 years, on the way to a Saints division winning game. The Saints won the NFC South title on December 26 and ended the 2011 season as the third seed in the NFC. They finished with a 13–3 record, beating Carolina 45–17 and also giving running back Darren Sproles the record for most all-purpose yards in a single season. The team broke numerous records that year including most yards in a season, completion percentage, yards passing, completions and more. The New Orleans Saints beat the Detroit Lions in the 2011 NFC wild-card playoff game 45–28. New Orleans also tied the NFL's postseason mark for team first downs in a game (34), and broke the record for total yards with 626, eclipsing the yardage record set 49 years ago. The Saints lost Saturday, January 14, 2012, in the Divisional round in the playoffs against the San Francisco 49ers in Candlestick Park. A game that was considered an instant classic by many as the game saw numerous lead changes in the final four minutes of play. After an off-season dominated by news of the bounty scandal and the year-long suspension of head coach Sean Payton, the Saints sought to refocus on football and produce yet another winning year. Instead, the team, led by offensive line coach Aaron Kromer for its first six games, started the season with four straight losses and a last place spot in the NFC South. The team finally broke through with a win in Week 5, against the San Diego Chargers, a game that also saw quarterback Drew Brees break Johnny Unitas's longstanding record for consecutive games with a touchdown pass. After their scheduled bye, the Saints went on to win 4 of their next 5 games, to bring their record to an even 5–5. Joe Vitt returned after his six-game suspension to serve as interim head coach for the rest of the season. The team failed to hold its momentum, however, and lost the next three games, including a loss at Atlanta that also marked the end of Brees' record touchdown streak after 54 games, and a 52–27 blowout loss to the Giants that dropped the Saints to 5–8. Despite winning 2 of their last 3 games, and Brees again leading the league with 5,177 passing yards (his third time to surpass 5,000 yards, as he remained the only quarterback to break that barrier more than once), the team finished tied for last in the NFC South, at 7–9. The Saints defense allowed 7,042 yards, setting an NFL record. The Saints finished their 2013 preseason 3���1, and won their first five regular season games against the Atlanta Falcons, Tampa Bay Buccaneers, Arizona Cardinals, Miami Dolphins and Chicago Bears. The Saints under Sean Peyton had been winless in Chicago's Soldier Field and had not won in the Windy City since 2000. The Saints fared well against Chicago, Arizona and Miami, winning 26–18, 31–7 and 38–17 respectively, but needed a 4th down shutdown and a last-minute field goal to escape Atlanta and Tampa Bay. The Saints went on a 5–0 win streak, but were stopped short by the New England Patriots in Week 6, losing 30–27, with a touchdown pass by Tom Brady in the last 5 seconds of the game. New Orleans would go undefeated at home for the second straight season with Sean Payton as the head coach, but finish just 3–5 on the road. Key losses included a 7–34 blowout against the Seattle Seahawks on Monday Night Football in Seattle which cost them homefield advantage throughout the playoffs, a 16–27 upset against the St. Louis Rams in St. Louis which led to the Saints needing to win their next game against Carolina to control their own playoff destiny, and a heartbreaking 13–17 defeat to their division rival the Carolina Panthers in Charlotte who went on to win the NFC South. The Saints finished the season with an 11–5 record and earned a wild card berth as the sixth seed in the NFC. On January 4, 2014, the Saints recorded their first road playoff win in franchise history over the Philadelphia Eagles 26–24. On January 11, the Saints lost to the first seed, the Seattle Seahawks, once again in Seattle 15–23. The weather conditions were very poor, which gave the offense much difficulty. Despite the conditions, the defense of the Saints played well, holding Seattle to just 23 over the 34 points allowed against Seattle during the regular season. The Saints finished the season 7–9, second in their division behind the 7–8–1 Carolina Panthers. They missed out on the playoffs after being defeated 14–30 by their divisional rival, the Atlanta Falcons, in the second-to-last week of the season. This season was notorious in Saints history for having the 31st worst ranked defense in the league, which is one of the main reasons for the Saints poor 2014 campaign. The only two great performances by the defense out of the entire season came from a 44–23 home win against the Green Bay Packers and a 31–15 victory against the Chicago Bears in Chicago. The Saints finished with a 7–9 record for the second consecutive season. They were third in the NFC South after the 15–1 NFC champions Carolina Panthers and the 8–8 Atlanta Falcons. Their defense was historically bad. They allowed the most passing touchdowns in a season in NFL history as they allowed 45, effectively making them the worst passing defense in NFL history. They also set the NFL record in opposing passer rating (116.2), while finishing last in points allowed (29.8) and yards allowed per play (6.6). Atrocious play by defensive captain Brandon Browner, who set the NFL record for most penalties with 23, did not help the struggling Saints defense. Defensive coordinator Rob Ryan was fired near the half-way point in the season and was replaced by senior defensive assistant Dennis Allen. The Saints had strong play from their 2015 draft class. The Saints first pick Andrus Peat started at right tackle and left guard at certain points in the season, and other first-round pick Stephone Anthony finished his rookie season with 112 tackles, one sack, one interception, and two forced fumbles. He had two scores, both coming against the Carolina Panthers and led all rookies in tackles. Second-round pick Hau'oli Kikaha had 4 sacks. Canadian football star Delvin Breaux, who was signed in the off-season, led the Saints struggling secondary with 3 interceptions and 19 pass deflections. Drew Brees also tied the NFL record for touchdown passes in a game with 7, coming against the New York Giants. After a lengthy investigation conducted by the National Football League's security department, the league alleged on March 2, 2012, that 22 to 27 defensive players on the New Orleans Saints maintained a "pay for performance" program that included "bounty" payments administered by defensive coordinator Gregg Williams during the 2009, 2010, and 2011 seasons. NFL Commissioner Roger Goodell stated, "The payments here are particularly troubling because they involved not just payments for 'performance,' but also for injuring opposing players." The report also found out that head coach Sean Payton was aware of the allegations, but failed to stop the program. The league also said that Mickey Loomis, the Saints' general manager, was directed to end the program by owner Tom Benson, but actually did not. The memo released to NFL teams found Payton and Loomis guilty of "conduct detrimental" to the league. On March 21, 2012, Commissioner Goodell announced that, as a result of the bounty scandal and the NFL's investigation, Sean Payton has been suspended for one year, Gregg Williams was suspended indefinitely, and Mickey Loomis was suspended for the first eight regular season games. The Saints were also fined $500,000 and had to forfeit their second round draft picks in 2012 and 2013 respectively. Saints assistant coach Joe Vitt also was suspended six games and fined $100,000. Payton's suspension was effective on April 1, 2012, and all the suspensions were without pay. Goodell was particularly upset, that the Saints had lied about the scheme on two separate investigations. On May 2, 2012, it was announced that four players who played for the team between 2009 and 2011 would receive suspensions for their alleged participation in "Bountygate": Saints linebacker Jonathan Vilma (16 games), Saints defensive lineman Will Smith (4 games), former Saints/retired linebacker Scott Fujita (3 games), and former Saints/current Packers defensive lineman Anthony Hargrove (8 games). Most of the players who were the targets of questionable hits by the Saints, including Favre and Warner, claimed that the bounties were merely part of the game. However, several former players interviewed by Sports Illustrated said that while payments for good hits and sacks were indeed considered part of the game, bounties for intentionally injuring opponents violated an unwritten code. However, on July 26, 2012, Jonathan Vilma and seven other witnesses from the Saints testified in front of a federal judge in New Orleans that NFL commissioner Roger Goodell got his facts wrong in the bounty scandal. "Everybody was sworn in under oath in front of a judge with the risk of perjury and jail time if we were lying, and categorically denied there was a bounty", Vilma said in a text message to ESPN's Ed Werder. "Seven people testified, 2 sworn affidavits (one by Drew Brees) all saying the same thing. I ask that you and ESPN report the facts. No more bias or b.s. or hearsay. I gave you facts that you can report if so choose." Saints All-Pro quarterback Drew Brees made a controversial tweet on June 20, 2012, stating, "If NFL fans were told there were 'weapons of mass destruction' enough times, they'd believe it. But what happens when you don't find any????" Brees immediately issued another statement to clarify, "My WMD comment has nothing to do with politics or our brave military. Merely an analogy to show how media influences public perception." He went on to say, "I apologize if the WMD comment offended anyone. Especially our military. There is no one I respect more than our service men and women." On March 15, 2018, the Saints' owner Tom Benson died from flu at the age of 90 after he was hospitalized on February 16, 2018. Benson's wife Gayle Benson succeeded him as the owner of the Saints and the NBA's New Orleans Pelicans. Black, along with old gold and white, has always been one of the team colors, but it was not the first choice of original majority owner John W. Mecom Jr. His preference was for Mecom blue, a medium shade which was used by all of his other investments. The NFL office, however, informed him that his proposed combination too closely resembled that worn by the San Diego Chargers. Although the Chargers were members of the AFL, the older league did not want to offend its soon-to-be partner so soon after the merger. Mecom settled on black as the primary color as a nod to his financial involvement in the petroleum industry. "Black gold" is a term synonymous with oil. Although the Pittsburgh Steelers—who played a few home games in New Orleans during their early years to avoid conflict with the Pittsburgh Panthers football team—have long used black and gold as their colors, their shade of gold more closely resembles yellow, making the Saints black and gold compatible with the rest of the NFL. Except for minor modifications, the Saints' logo and uniforms have basically remained the same since the club debuted in 1967. The team's logo is a fleur-de-lis (a symbol of the City of New Orleans and of France's Royal Family, which included the House of Bourbon), while its uniform design consists of gold helmets, gold pants, and either black or white jerseys. Minor changes to the uniform stripes and trim have been made throughout the years. The team wore black helmets during the 1969 preseason, but NFL commissioner Pete Rozelle barred the Saints from using the helmets during the regular season, since Mecom did not notify the league office of the change. Black helmets have never been introduced since, not even as an alternate helmet prior to 2013, when the NFL began to require teams to use only one helmet shell per season. The Saints predominantly wore white at home when the club played at Tulane Stadium from 1967 through 1974 (except in 1969 and 1970), forcing opponents to suffer in their darker jerseys in the subtropical climate of New Orleans. When the surface at Tulane Stadium switched from natural grass to PolyTurf in 1971, field temperatures became hotter still. In Archie Manning's first game, in the 1971 season opener against the Los Angeles Rams, temperatures on the field reached as high as 130 °F (54 °C). The heavily favored Rams wilted in the stifling heat, and the Saints claimed their first-ever victory over their NFC West rivals, 24–20, on Manning's one-yard quarterback sneak on the last play of the game. The Saints switched to white pants in 1975, coinciding with the team's move from Tulane Stadium to the Superdome, and have worn white at home numerous times since then. One year later, they started to wear black pants with their white jerseys, a move influenced by coach Hank Stram, who introduced red pants to the Kansas City Chiefs' uniforms in 1968. In an October 3, 1976 home game against the Houston Oilers, Hank Stram used the Saints' road uniforms, the white jerseys and black pants. The Saints lost that game 31–26. During the 1981–82 seasons (Bum Phillips' first two seasons as coach), the team wore white jerseys with black pants at home, but reverted to the black jerseys and white pants for 1983. They reverted to wearing gold pants with both their black and white jerseys in 1986 under new coach Jim E. Mora. From 1986 through 1995, the sleeves of the jerseys and sides of the pants featured a logo with a fleur-de-lis inside an outline of the state of Louisiana (with the location of New Orleans marked with a star in the state outline). The logo replaced the striping pattern that had been on the uniforms since the team's inception; save for color variations, the striping pattern was similar to that used by the Washington Redskins (until 1979), Green Bay Packers (until 1997), and Cleveland Browns (until 2014), which is likely why the change was made. That logo was removed in 1996 and replaced with a fleur-de-lis on both the sleeves and sides of the pants. The team introduced a gold alternate jersey (worn with the black pants) during a December 15, 2002 game versus the Minnesota Vikings, a 32–31 loss, but have never worn them since then. Because of the metallic gold's bright color, the gold jerseys were considered the "light" jersey in the game, so the Vikings wore their purple home jerseys as the "dark" colored team. One team must wear "dark" and one team must wear "light", this was done because of black & white t.v. broadcasts so viewers could tell the teams apart. The only exception being if both teams are wearing throwback uniforms, such as Thanksgiving Classic games. From 2003 through 2007, the New England Patriots had a "light" jersey (their alternate, a bright metallic silver) that is not white in which the other team would wear their colored, or "dark" jerseys against them since the third jersey rule was implemented in the NFL in 2002. The Saints also introduced a 1967-style throwback uniform in a 23–20 win on December 1, 2002, against the Tampa Bay Buccaneers. This uniform was not worn again until a 40–33 win against the Houston Texans on September 25, 2011, and also on November 6, 2011, against the Tampa Bay Buccaneers in a 27–16 Saints win. However, the 2011 throwbacks use the current-helmet, meaning the shades of gold on the helmet and jersey do not match. In 2009, the Saints wore the black pants only once, beating St. Louis 28–23. They wore the white jerseys/gold pants combination during the Super Bowl XLIV victory over the Indianapolis Colts. In 2012, the Saints wore black pants 12 times and wore gold pants 4 times. In 2013, gold pants were used only 7 times (including playoffs). The Mercedes-Benz Superdome is the Saints' home stadium. It has a listed seating capacity of 76,468 (expanded) or 73,208 (not expanded). The Saints own a perfect record there against the Houston Texans (2–0) and Jacksonville Jaguars (3–0), but a winless one against the Baltimore Ravens (0–2). The Saints' oldest rival are the Atlanta Falcons. The Falcons lead the rivalry series 52–48. The two clubs joined the NFL within a year of each other as expansion teams and have played each other twice a season since the Saints joined the league in 1967. The Saints have a developing rivalry with the Tampa Bay Buccaneers, who have been part of the NFC South with the Saints since 2002. The Saints and the Carolina Panthers have been minor rivals since Carolina joined the league as an expansion franchise in 1995. The teams have been divisional rivals since then, originally in the NFC West and then in the NFC South since 2002. This series has been extremely close. As of December 17, 2018, the series are tied 24–24. Carolina defeated New Orleans on the road every year from 2002 to 2008, a streak of seven seasons. Notable games include Carolina's 19–7 home victory in 1996 that sparked Saints head coach Jim Mora's infamous "Diddley Poo" rant and resignation from the team, Carolina's 10–6 win in the 2002 season finale at the Superdome to knock the Saints out of the playoffs, and the emotional 2005 season opener at Carolina where the Saints won 23–20 in the face of Hurricane Katrina and an eventual 3–13 season. In their last game in the 2014 NFL season, a fight between players broke out in the end zone and spilled out into the tunnel entrance after a Cam Newton touchdown, with Panther's tight end Brandon Williams getting ejected and both teams receiving offsetting penalties. The Panthers won the contest 41–10, with early turnovers by the Saints being a factor in the blowout. On January 7, 2018, the two teams met in the NFL playoffs for the first time in the Wild Card round. It was the first ever playoff game between NFC South teams since the division's formation in 2002. The Saints beat the Panthers 31–26, thus eliminating Carolina. The rivalry has been heated since then. To commemorate the club's 45th anniversary, the New Orleans Saints Hall of Fame selected its All-45th Anniversary Team. The Hall of Fame updates its all-time team every five years, and this latest squad of head coach and players features four standouts from the club's roster at the time of selection: QB Drew Brees, G Jahri Evans, and DE Will Smith as well as head coach Sean Payton. The Joe Gemelli Fleur-De-Lis Award is given yearly to a person who has contributed to the betterment of the New Orleans Saints organization. The award is named for Joe Gemelli, a New Orleans clothing store owner and an active supporter of sports in the city, who was known as the team's biggest fan. The Saints' flagship station is WWL (870 AM/105.3 FM), one of the oldest radio stations in the city of New Orleans and one of the nation's most powerful as a clear-channel station with 50,000 watts of power. Former Saints guard Zach Strief is the play-by-play announcer, with former Saints running back Deuce McAllister as color commentator. Strief succeeded longtime play-by-play announcer Jim Henderson in 2018, and McAllister succeeded another former Saints running back, Hokie Gajan, in the role after Gajan's death on April 11, 2016, from liposarcoma. Henderson was the play-by-play announcer for Saints radio broadcasts continuously from 1993 to 2017, and previously held the position from 1986–89 after serving as a color commentator from 1981-85, and again in 1992, when Dave Garrett was play-by-play announcer. Previous color commentators include former Saints players Archie Manning (QB, 1971–82) and Stan Brock (OT, 1980–91). Most preseason games are televised by WVUE (Channel 8), a station which has been owned by a consortium led by Saints owner Tom Benson since mid-2008, and, as the Fox affiliate for New Orleans, carries the majority of Saints games; both stations also carry a heavy complement of coach and player shows. Tim Brando and Jon Stinchcomb call the preseason games for the Saints. Saints preseason games were previously produced by Cox Sports Television. Beginning in the 2015 season, owing to Raycom Media's management of the station on behalf of Tom Benson's ownership group, production of preseason telecasts were taken over by Raycom Sports under a new multi-year deal, and syndicated to Raycom stations and others around the team's footprint. Regular season games are also aired on WWL-TV, the local CBS station whenever they host an AFC opponent (and games vs. NFC opponents cross-flexed from Fox to CBS) and NBC affiliate WDSU via Sunday Night Football. ^ "Key Moments in Saints History". NewOrleansSaints.com. NFL Enterprises, LLC. Retrieved September 6, 2018. ^ "Staff Directory" (PDF). 2018 New Orleans Saints Media Guide. NFL Enterprises, LLC. July 25, 2018. Retrieved September 17, 2018. ^ "New Orleans Saints Team Capsule" (PDF). 2018 Official National Football League Record and Fact Book. NFL Enterprises, LLC. August 9, 2018. Retrieved September 6, 2018. ^ "A message from Owner Gayle Benson to Saints fans". NewOrleansSaints.com. NFL Enterprises, LLC. March 16, 2018. Retrieved September 6, 2018. ^ "Gayle Benson: I will own, operate Saints for the rest of my life". NFL.com. NFL Enterprises, LLC. April 12, 2018. Retrieved September 6, 2018. ^ a b Bishop, Greg (February 4, 2010). "Beneath Brown Bags, Saints Had Loyal Fans". The New York Times. Retrieved May 25, 2016. ^ a b "New Orleans wins berth in grid loop". Spokane Daily Chronicle. (Washington). Associated Press. November 1, 1966. p. 17. ^ a b "New Orleans lands franchise in NFL". Milwaukee Sentinel. Associated Press. November 2, 1966. p. 1, part 2. ^ "Governor Jindal & Saints Announce New Superdome Name to be "Mercedes-Benz Superdome"" (Press release). New Orleans Saints. October 4, 2011. Retrieved October 2, 2015. ^ Woodyard, Chris (October 4, 2011). "Mercedes-Benz buys naming rights to New Orleans' Superdome". USA Today. Retrieved October 2, 2015. ^ Sandomir, Richard (January 27, 2010). "Congress's Team: Deal for Merger Included Saints". The New York Times. Retrieved February 7, 2010. ^ Mule, Marty (February 8, 2010). "Dave Dixon, driving force behind Superdome, dies". Times-Picayune. Retrieved September 22, 2010. ^ "Rams get scare but top Saints". Milwaukee Sentinel. Associated Press. September 18, 1967. p. 2, part 2. ^ "Dempsey's 63 yard FG jolts Lions". Milwaukee Sentinel. Associated Press. November 9, 1970. p. 1, part 2. ^ "Colts jolt Bears, 13-9, get record 56-yard field goal". Milwaukee Sentinel. Associated Press. September 28, 1953. p. 2, part 2. ^ Clayton, John (March 14, 2006). "Brees agrees to six-year deal with Saints". ESPN.com. Retrieved September 18, 2018. ^ Carpenter, Les (September 24, 2006). "The Saints Bring Hope to the Faithful". The Washington Post. Retrieved February 24, 2017. ^ "saintsdoggle: UPDATE: Saints sell out suites for 2007 season; Season ticket wait list 25,000 deep; San Antonio finally giving up?". Saintsdoggle.blogspot.com. March 15, 2007. Retrieved February 7, 2010. ^ "Most Viewed Telecast". Nielson. February 7, 2011. Retrieved August 8, 2013. ^ "Saints defense held itself back in 2015". theadvocate.com. January 20, 2016. Retrieved February 11, 2016. ^ "Saints Brandon Browner sets NFL penalty record". Nola.com. December 21, 2015. Retrieved February 10, 2016. ^ Orr, Connor (November 1, 2015). "Drew Brees ties single-game record with 7 TD passes". NFL.com. Retrieved February 11, 2016. ^ "NFL says Saints created 'bounty' program from 2009–2011". nfl.com. March 2, 2012. ^ "Statement From Saints Owner Tom Benson". neworleanssaints.com. March 3, 2012. ^ "NFL Announces Management Discipline for New Orleans Saints". neworleanssaints.com. March 21, 2012. ^ "Vilma hearing ends with no decision on return". ^ "New Orleans Saints linebacker Jonathan Vilma does not receive restraining order, still hopeful for favorable ruling". ^ "New Orleans Saints, Pelicans owner Tom Benson passes away at age 90". NewOrleansSaints.com. March 15, 2018. Retrieved March 15, 2018. ^ Langenhennig, Susan (November 30, 2009). "Power colors: Black and gold are tops on the red carpet – and this season – on synthetic turf". The Times-Picayune. Retrieved February 11, 2016. ^ Hanzus, Dan (December 8, 2014). "Panthers, Saints involved in wild fracas at Superdome". NFL.com. Retrieved February 11, 2016. ^ "Pro Football Hall of Fame page for Mike Ditka". Profootballhof.com. October 18, 1939. Retrieved February 7, 2010. ^ "Hall of Famers » WILLIE ROAF". Profootballhof.com. Retrieved January 25, 2013. ^ [Duncan, Jeff (August 6, 2017), "A great night for the Great Dane: Morten Andersen becomes Saints' third Hall of Famer", Nola.com. ^ "New Orleans Saints Team Facts". Pro Football Hall of Fame. Retrieved February 23, 2016. ^ "NFL Retired Player Numbers". NFL.com. NFL Enterprises LLC. Retrieved February 23, 2016. ^ Triplett, Mike (August 3, 2015). "Saints add K Morten Andersen to exclusive Ring of Honor". ESPN. Retrieved August 4, 2015. ^ Holder, Larry (April 10, 2016). "Will Smith unanimously named to Saints Hall of Fame in March". nola.com. The Times-Picayune. Retrieved April 10, 2016. ^ a b Erickson, Joel A. (May 23, 2017). "Jonathan Vilma and Carl Nicks bring Super Bowl legacies to Saints Hall of Fame". New Orleans Advocate. Retrieved May 24, 2017. ^ a b c "Moore, Thomas and Hebert set to be honored by Saints Hall of Fame in September", New Orleans Saints, June 14, 2018. ^ a b c "Complete list of Saints Hall of Fame members". New Orleans Saints. Retrieved May 20, 2015. ^ Joe Gemelli, Allstate Sugar Bowl Hall of Fame. Retrieved May 20, 2015. ^ "McAllister, Benson, Henderson to be honored by Saints Hall of Fame" Archived May 23, 2012, at the Wayback Machine, WWL-TV, May 18, 2012. ^ "Nastasi, Piazza to Share Saints Hall of Fame's Joe Gemelli Fleur de Lis Award", SportsNola.com, May 20, 2014. ^ Tyrone Hughes, Michael Lewis elected to the New Orleans Saints Hall of Fame "SMG executive VP Doug Thornton will receive the Joe Gemelli Fleur de Lis award for his contributions to the Saints and the entire region", New Orleans Saints, May 19, 2015. ^ "Hokie Gajan to be honored with Joe Gemelli Fleur de Lis award", New Orleans Saints, April 12, 2016. ^ Erickson, Joel A. (May 23, 2017). "Jay Romig carries on family tradition by earning Joe Gemelli "Fleur-de-Lis" Award". New Orleans Advocate. Retrieved May 24, 2017. ^ Triplett, Mike (April 12, 2016). "Hokie Gajan, ex-Saints fullback, radio voice, dies at 56 of cancer". ESPN.com. ESPN. Retrieved April 12, 2016. ^ "New Orleans Saints, Raycom Media announce partnership". New Orleans Saints. Retrieved December 24, 2015. Wikimedia Commons has media related to New Orleans Saints.